The demo outing of California death metal act Deeds Of Flesh is interesting in how more traditional it sounds in comparison to the band’s later output. Largely influenced by Cannibal Corpse, and Suffocation “Gradually Melted” is a modern interpretation of the classic death metal sound. On this EP Deeds Of Flesh is not yet as over-the-top, technical and linear as they would become in later years. The demo was released in a variety of formats through different labels, yet remains one of the band’s strongest offerings. 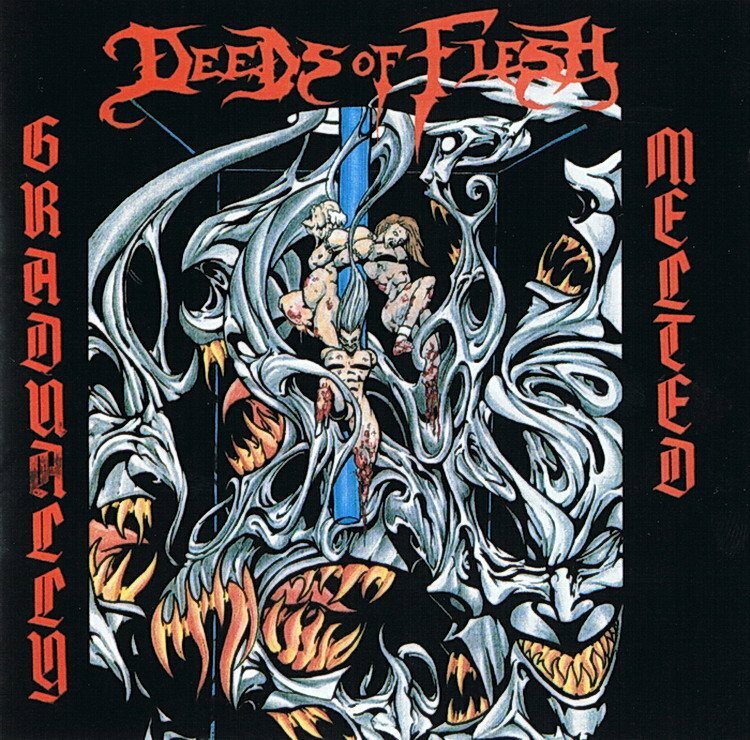 Deeds Of Flesh is widely regarded as one of earlier progenitors of the brutal subset of the death metal genre on the North American continent, along with fellow San Diego act Disgorge. The latter however predates them by a year, having formed in 1992. Formed in 1993 by Erik Lindmark (vocals, rhythm guitar), Jacoby Kingston (vocals, bass guitar), and drummer Joey Heaslet. Lindmark gained valuable experience in the shortlived California death metal band Charlie Christ. In comparison to his preceding outfit Deeds Of Flesh is far more stripped down, percussive and speed-oriented Likewise are Lindmark’s vocals far drier and less emotive here than in his previous band. It goes without saying that subtlety and nuance weren’t any of the band’s strong traits. Essentially the trio plays a modern and more technically refined take on Cannibal Corpse circa “Butchered at Birth” albeit without that band’s compositional range and lead playing. The dual growl/shriek vocals are lifted from veteran Tampa, Florida death metal act Deicide, whose album “Legion” also was instrumental in shaping the band’s sound. Rhythm guitarist Erik Lindmark has a very dry grunt, while the growl of bass guitarist Jacoby Kingston is more percussive and emotive. The trio’s music is based around linear, atonal riffing that shifts more than it flows. Relentless blast-oriented drumming with minimal yet creative fills and rolls propels the riffing forward. The sheer level of percussive thrust is detrimental to the overall dynamic range, but this wouldn’t become problematic in itself until the defection of co-founder Joey Heaslet. One of the trio’s characterizing strengths in the early part of its career was the drumming of Joey Haeslet. Heaslet applied old school techniques within a modern percussive framework. In comparison to much of its later output “Gradually Melted” isn’t very interesting from a lyrical perspective. Most of the EP deals with the standard subject of gore. Of the subjects that would become cornerstone in the trio’s writing only torture in medieval antiquity and warfare are dealt with in one track each. ‘Gradually Melted’ deals with the “death by fire” torture technique of the Inquisition. ‘Human Sandbags’ is the first in a long line of Deeds Of Flesh tracks about the horrors of war. ‘Feelings Of Metal Through Flesh’ is a song about aborticide. The band would only return to a similar subject once on its debut “Trading Pieces”. The brevity of the demo/EP and the impressive level of musicianship thankfully redeem the mostly forgettable lyrical fodder. As was the case with the lone Charlie Christ album Deeds Of Flesh recorded its demo session at Sandor Sound Studios with Ed Sandor producing. Compared to the band’s own post-“Path Of the Weakening” output the production here is quity crunchy, earthy and organic sounding. The production on this demo isn’t overly polished, and sounds like a cleaned up rehearsal recording. Intended to be a demo, “Gradually Melted” ended up being released on tape and CD format by infamous California label imprint Wild Rags Records in 1995. It was re-issued with different artwork (this time from Jon Zig) by Artist Development Concepts in 1998, and finally re-released for the third time in remastered format with different artwork by Unique Leader Records in 2013. As promising and lively as “Gradually Melted” sounds its puzzling that Deeds Of Flesh end up chosing the direction they did. “Gradually Melted” and its successor can be clearly linked to a number of classic genre acts, but was interesting enough to stand on its own.